The Sounds of Summer concert series takes place at Battle Point Park , a short drive from the Bainbridge- Seattle ferry terminal. The 90 acre park boasts open spaces with two ponds, jogging trail, shelters, play areas and various sports fields. The park is also host to the Battle Point Astronomical Association as well as community gardening plots. If that’s not enough, the Bainbridge Island Metro Parks and Recreation District sponsors free concerts on Wednesday evenings until August 15th. Enjoy live music from 7-9 pm with kid’s activities and light concessions. If you are looking for direct ferry access to live music Rock the Dock is a sure bet. Just steps from the Bremerton – Seattle ferry terminal this free concert series takes place on the boardwalk adjacent to the Bremerton marina and the USS Turner Joy. The boardwalk is a short distance from the historic Admiral and Roxy theaters, the treasured Valentinetti Puppet Museum, shops and craft breweries. Sponsored by the Bremerton Downtown Association, Rock the Dock continues at 5pm Saturdays in August until August 19th. Summer Sounds at Skansie Park is on its 16th year of free live music. Nestled in the heart of downtown Gig Harbor, Skansie Park’s historic roots make it a charming venue for outdoor events. Host to the Annual Maritime Gig Festival, Holiday Tree Lighting and of course summer concerts it is a must see stop while in Gig Harbor. The concerts run through August 14th every Tuesday from 6:30 to 8pm. TIP: On Thursdays catch another concert series at Uptown Gig Harbor. Concerts are free and start at 6 pm. Kingston may be known for its quick access to Edmonds – but there is more to the town than the ferry terminal. Host to a number of small businesses and eateries, Kingston is worth waiting for the next ferry. Local favorites include Mossback, The Grub Hut, Borrowed Kitchen Bakery, Downpour Brewery and many more. Kingston Cove summer concerts begin at 6 pm every Saturday until August 25th at Mike Wallace Park. The concert is free and features a beer garden. Manette is a short distance from the Bremerton – Seattle ferry terminal and worth the walk in good (and even bad) weather. Every Thursday until August 16th the Manette Business Association hosts Music in Manette – a free concert series on the waterfront at Whitey-Domstad Park. The music starts at 6:30 but there are many local shops and restaurants to explore. Check out the Boatshed or Nightshade for a meal before the show and Honor Bar or DerBlokken Brewery afterwards for drinks. . If you haven’t been to the picturesque enclave of Port Orchard, free live music is the perfect excuse. Located just across the water from the Bremerton ferry terminal, Port Orchard is a short ride on the historic foot ferries that once made up the Puget Sound Mosquito Fleet. Hop off the WA state ferry and onto the Carlisle II or Admiral Pete for a 10 minute ride to Port Orchard’s Marina. The Concerts by the Bay series is only a few steps away and so is Downtown Port Orchard. Visit the merchants on Bay Street for a bite, chocolates, comic books, vintage wares and ice cream. The Sidney Museum and Arts Association is a great place to cool off and take a look at the history and art of the town. Concerts are every Thursday in August at 6:30 pm. Poulsbo or Little Norway is known for its Norwegian heritage and small town charm, but on Tuesday evenings through August 14th it plays host to Summer Nights at the Bay. A quick drive from the Bainbridge Island ferry, this free concert series takes place at the Muriel Williams Waterfront Park in Historic Downtown Poulsbo. You may need an entire weekend to explore the shops, art galleries, and eateries along front street so be sure to come early. 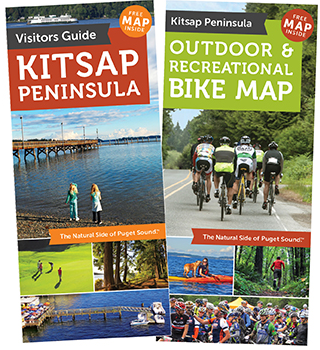 If you need recommendations pop in at the Poulsbo Maritime Museum and Visitor Center for a look at the town’s history and the scoop on breweries, coffee houses and businesses downtown. The waterfront lawn at Clearwater Casino & Resort is a sight any day but on Thursdays in summer it is packed with fans of the biggest names in music. Performances on the Passage features some of the best tribute bands found anywhere, including: The Bee Gees, ABBA, Jim Morrison and Selena. The lawn opens at 5 pm and the music starts at at 7 pm. This concert series is free and open to all ages with lite fare and drinks available for purchase. TIP: The lawn also hosts movies on select Sunday nights after dark. While it is not free, Music on the Estuary deserves an honorable mention. Make the drive for an evening of music, nature and art at the Pacific NW Salmon Center on Saturday August 25th. The show is from 4:30 to 8 pm; tickets are $5.